Peel all the potatoes and reserve only the skin. Do NOT use the inside. Discard remaining potatoes (or put in a bag and set aside in the refrigerator for use after your cleanse). Add the skins to a large stock pot. Roughly chop the carrots, leaving skin on, and add to the stock pot along with the celery sticks. Slice the beets and add the sliced beets along with their greens to stock pot. Peel the onions and discard peel, then slice and add to the pot. If you purchased pre-peeled garlic cloves, add to the stock pot. If not, peel garlic cloves and add to pot. Add enough clean filtered water to the pot until it is filled to the top (the exact amount of water is not important, just enough to cover everything in the pot). Cover and simmer on low for 40-60 minutes. Strain out the vegetables and discard. Cool so you don’t burn your mouth and drink broth. Refrigerate leftover broth in glass containers for use over the next couple of days. If desired, add some “Bragg Liquid Aminos” for flavor. First thing on rising, drink 8oz of pure water to flush your digestive tract. Roughly chop 1 garlic clove (increase by 1 clove each day) and add to blender first. Then thinly slice a 1” piece of ginger (cut across the grain into 1/8 inch pieces to help break up the fibers) and add to blender along with the lemon juice. This will allow you to totally liquefy the garlic and ginger before adding the remaining ingredients and minimize any “chunking”. One other trick is to slice the chunks of ginger into smaller pieces across the fiber. This will prevent longer fibers from appearing in your drink. Once liquefied, add 1 tbsp. of olive oil (increase by 1 tbsp. each day), orange juice, and 8 ounces of pure water. Blend on high until well blended and frothy. 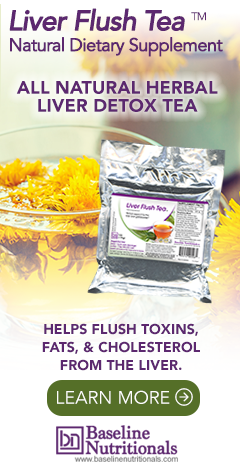 The Liver Flush Tea™ helps with the flushing process itself, but also helps minimize any discomfort or nausea. The key herb in the tea is dandelion root, one of the strongest herbal lipotropics known. That is to say, it flushes fat deposits from the liver. Other herbs that you will find in the tea include things like: ginger, clove, cinnamon, burdock root, and horsetail. Incidentally, some of the other herbs used in the tea (such as uva ursi, parsley root, and juniper berries) are also extremely beneficial to the kidneys. From Jon, "I like to make my tea in a big 8 quart Dutch Oven pot. I fill the pot the night before and add 4-5 tablespoons of Tea, which I let soak overnight. In the morning I simmer for 20 minutes. Then I turn the heat to as low as it goes to keep the tea warm and scoop out cups as I want during the day. I'll drink 5-8 cups a day." enough carrots to make 20-24 oz of juice. Under Recipes, Juicing instruction: It says any combo of fruit or veggie will do. Then it says ONE EXCEPTION IS mixing apple and carrot. Then it goes on to give a recipe that has them both in it. That reads contradictory to me. It sound like I'm not supposed to combine the two. Could you reclarify. The directions are correct. The only time you should combine fruit and vegetables when juicing is when juicing with an apple or carrot. Hi, this is still unclear to me... does that mean that when I juice vegetables the only fruit I can add is an apple and when I juice fruits the only vegetable I can add is a carrot? Exactly! Carrots and apples can basically go in any fruit or veggie combination. Do you only eat and drink these? Is it like a fast or do you add this to your normal diet. Yes, the Liver Detox incorporates a 3 day juice fast. I have a friend with cirrhosis of the liver and no colon. Is there a juice that will help improve her liver without the stress of the loss of her colon? For obvious legal reasons, we can not diagnose or prescribe. That said, everything on our website is natural, but be sure your friend works with her doctor. Are there any unpleasant side effects from the cleanse? Eg headaches etc. I’m wondering if I could do it and still get to work? I found that I had to keep running to the loo. Also my daughter complained about my breath!